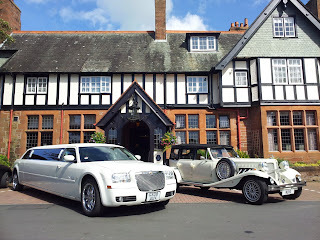 Wedding Limousines Scotland: WEDDING CARS! ALL IN A DAYS WORK! "In February this year, my bride and groom decided to book a company for their cars to take them to their wedding venue in July 2012. Everything went well. They picked their cars and paid the deposit. A few weeks ago, I received a letter from the company explaining that they had gone into liquidation! I couldn't believe it! Immediately, I put a message on Twitter for some help and got in touch with some wonderful contacts. Wedding and Baby was on the case and put me in touch with an amazing guy called Chris, who is the owner of a company called Nuvo Limousines. Chris was fantastic. He helped so much. I spoke with my bride and groom who were over the moon that there was a company out there with the cars they were looking for. They had originally decided on a Chrysler stretch limousine and Chrysler 300c saloon from the other company, which were lovely cars, but I must say that Chris' stretch limo is second to none. To top that, we also got the Beauford which is GORG! So, all in all, we won a watch hiring Chris at www.nuvolimos.co.uk and thanks to www.weddingandbaby.co.uk for their help too."